Xtratime Community > Xtratime Resources > Support > Questions & Suggestions > Problem in the music forum. 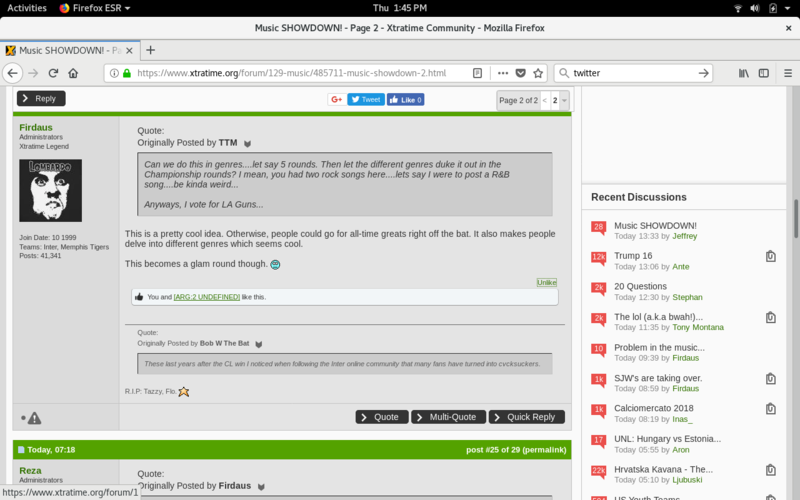 Problem in the music forum. also what's the thing with image files not showing up? Why? There was a lot of good music in 2012. Maturin, Mutu, Cam, Rob.. that forum lost some good ones.. I don't think Rob is permanently gone. Well I hope not. He's usually present during the transfer windows at least. Yeah this has been annoying me lately. Good point, though to the Music forum he prolly is gone. Yes. It's quite easy to fix it. VS merely needs to edit the code and add the letter 's' the url, so that it reads HTTPS instead of http and it will be fixed. I've asked them this months ago already, but it hasn't been done yet. Alternatively they could give the XT Admins access to the code, like it was in the past, but that hasn't been done either. Last edited by Boyo; November 14th, 2018 at 06:59. Only content from other HTTPS sites can be hotlinked. Even @red has abandoned the music forum. I don't go very often anymore either...well, till now. Because of all the glam you've been posting, I read that as hot pink. Boyo and TTM like this. First the DP, now hot pink. And it's not even a full moon yet! I liked a post by Firdaus and next to my like it seems the post has also been liked by one of our forums, one that doesn't exist in fact. You can see the link to the forum in the bottom left hand side of the screenshot. I saw it as "Boyo and Boyo like this". @Boyo , get ready to appear before the Senate Committee. I corrected the links but each post now needs to be edited and then re-saved which I'm still working finding a way to do it automatically as it'll take forever and a day to do it manually. Inácio and Jeffrey like this. Why would the posts need to be edited? If the TUB code is correctly written, it should already adjust all the posts automatically. The thing is, the code still doesn't appear to be correct. Could you please post or PM me the code? Edit: I had originally written a [TUB] but that gets automatically change to a [YOUTUBE] tag. Last edited by Boyo; November 21st, 2018 at 20:27. Now the [tub] code tag gets automatically changed to a [youtube] tag. That's not going to solve it. What exactly did you do? I changed it back to tub. I believe Niall edited the custom bbcode. Is this working on your end now? No. The TUB tags still get converted to YOUTUBE.